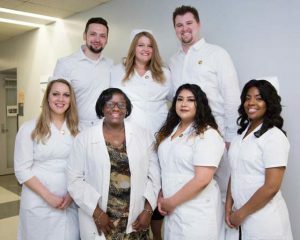 SOUTH HOLLAND – South Suburban College recently honored the 2018 graduates of the College’s Associated Degree Nursing Program. The graduates received their nursing pins from faculty members Oluwakemi Adeyemi and LaDonn Dickens. Graduate Carl Engfer introduced the guest speaker, SSC alumna Michelle Warszalek, MS, RN. Michelle obtained her ADN from Thornton Community College in 1981, her BSN from Governors State University in 1986, and her MS, her Major in Nursing Administration and Minor in Mental Health Nursing from St. Xavier University in 1990. Michelle has 37 years of nursing experience in a variety of settings. Speaking on behalf of the graduating class were Catherine Newport and Anastasios Koutsis. The closing address was given by Dr. Miriam Anthony, SSC’s Dean of Nursing. SSC’s ADN Program is a two-year Associate in Applied Science program that provides learning experiences directed by faculty in local hospitals and health agencies to focus on the direct nursing care of patients of all ages. Upon completion of the program, graduates are eligible to take the National Council Licensure Examination (NCLEX) for Registered Nurse (RN). For more information about the program, contact Dr. Miriam Anthony, Dean of Nursing at 708-225-5840 or Ms. Patricia Mitchell at 708-596-2000, ext. 2260.